I've been slowly working my way through Life, a nature documentary TV series produced by the BBC. It's wonderfully shot (lots of fantastic time-lapse sequences) and there's classic Attenborough narration to walk you through a strong sampling of the amazing stuff organisms manage to get up to. The episode on plants has been on my mind lately. It touches on several of the strategies they use to obtain light (e.g. vines growing up a tree to escape its shadow) or essential nutrients (insect-capturing residents of nitrogen-poor bogs). I started thinking about a small flowering plant I've seen on springtime nature walks. How does it succeed? I did some reading and realized it was a cool little organism worth writing a post about. So here we are. In the temperate forests of the world, a subset of plants make a go of it by racing out ahead of larger trees just after the snow melts to grow leaves and rapidly capture sunlight to make carbohydrates (food) before a canopy of tree leaves closes in above them. They then die back with the approach of summer, their leaves and seeds providing nutrients to support the growth of their plant and animal neighbours. This ephemeral springtime growth strategy is very important at an ecosystem level since it provides an early much-needed influx of nutrients to a forest after a desolate winter. 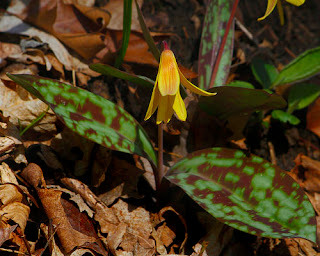 Going by such names as trout lily or yellow dogtooth violet, Erythronium americanum is a small member of the lily family (Liliaceae) that appears all over deciduous forests in eastern North America in the spring. It's a cold-tolerant perennial forb that flourishes in the brief period between the disappearance of snow (or just beforehand) and the appearance of leaves on the trees towering above it. 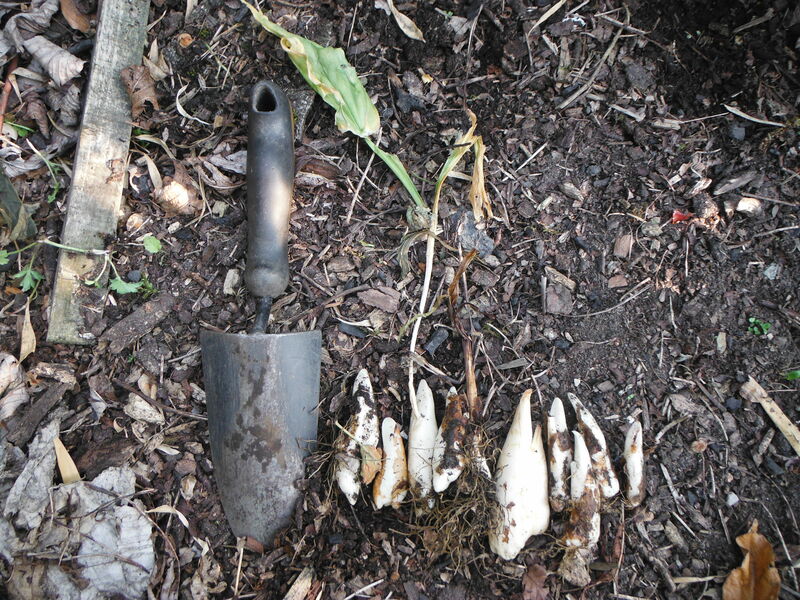 E. americanum survives the winter by storing food in underground bulb-like structures called corms, which are apparently edible and taste something like cucumber. Trout lily refers to its blotchy green-purple/brown leaves apparently being reminiscent of the skin of a brook trout. Dogtooth violet refers to its tapered white corms resembling the canine teeth of a dog, although it's a lily, not a violet. Come springtime, young corms send up a single leaf and focus on underground growth, while older plants make two leaves and single yellow flower composed of six petals. These flowers, which are among the first to bloom, do a nice job of brightening up the otherwise drab spots beneath trees in the spring. Pollination occurs via insects such as bumblebees. In addition to producing seeds, the plant spreads by sending out runners (horizontally growing stems) from which new corms develop. A single plant can potentially grow into a large decades-old colony. Neighbours benefiting from E. americanum include plant-eating mammals, ants, fungi, and sugar maples. Several species of scavenging ants (e.g. Aphaenogaster rudis) feed on a nutrient-rich bit of flesh (elaiosome) attached to each seed of the plant. In doing so, they help to disperse the seeds (by taking them back to their nests) and minimize how many of them are eaten (and inactivated) by other organisms. The roots of the plant are frequently colonised by arbuscular mycorrhizal fungi, a relationship benefiting both organisms. The fungi get access to delicious carbohydrates present in the roots, while helping the plant acquire nutrients from the surrounding environment. Specifically, the presence of these fungi is associated with larger corms (i.e. more food to get them through the winter and help them grow in the spring). Interestingly, the same fungi invade the roots of E. americanum and sugar maple trees (fungi are totally the original LAN), enabling the two plants to trade food back and forth based on their relative degree of hunger. In the late spring, as E. americanum is in full photosynthesis mode, food is transferred to nearby sugar maple saplings to help them grow leaves of their own. In turn, in the early autumn, food moves from still-photosynthesizing maple trees to E. americanum, as the latter is producing new roots and having them colonized by the food-stealing fungi. Soaking any part of the plant in water will release molecules capable of inhibiting the growth of bacteria and fungi. In particular, an α-methylene-γ-butyrolactone called tulipalin A (also produced by tulips such as Tulipa gesneriana) is good at killing fungi, particularly a type of Fusarium oxysporum known to infect and rot the bulbs of tulips. This molecule is also responsible for a contact dermatitis known as "tulip finger" where it gets inside a person's skin and initiates an allergic reaction. It's usually seen in workers who handle tulips and their bulbs. Tulipalin A can be used to make thermoplastic elastomers, potential applications of which include medical devices and vehicle parts. These polymers have the added bonus of being renewable, as opposed to plastics made using petroleum. Nomura T, Hayashi E, Kawakami S, Ogita S, Kato Y. 2015. Environmentally benign process for the preparation of antimicrobial α-methylene-β-hydroxy-γ-butyrolactone (tulipalin B) from tulip biomass. Bioscience, Biotechnology, and Biochemistry 79(1):25-35. Shin J, Lee Y, Tolman WB, Hillmyer MA. 2012. Thermoplastic elastomers derived from menthide and tulipalin A. Biomacromolecules 13(11):3833-3840. Tessier JT. 2013. Seasonal timing of corm development in Erythronium americanum. The Journal of the Torrey Botanical Society 140(1):26-30.